Red, purple or green, grapes are a healthy food to include in your diet. They're low in calories, high in vitamins and minerals and contain antioxidants that may provide benefits to your health. The U.S. Department of Agriculture considers 1 cup, or about 32 small seedless grapes, to be a serving. Adults should aim to have 1 1/2 to 2 cups of fruit per day, whereas children need 1 to 2 cups per day. 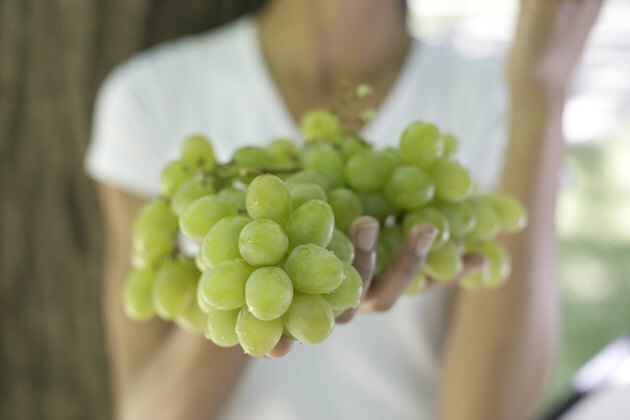 One cup of grapes provides 104 calories and is fat-free. It also provides 1 gram of fiber and is high in vitamins C and K. In addition to these benefits, red and purple grapes contain a powerful antioxidant called resveratrol, which may help to protect brain, heart and immune health. Grapes make a filling snack, as they contain water and fiber to help fill you up. You can add grapes to salads, such as a green salad, chicken salad or tuna salad, or eat them in a fruit salad for breakfast or dessert. You can also freeze grapes, which makes for a sweet treat on a warm day. USDA ChooseMyPlate.gov: How Much Fruit Is Needed?